Google is planning to make its Call Metrics call-tracking capability available to U.S. and Canadian AdWords advertisers. Search Engine Land explained what this move means to digital marketers. The beta version of Call Metrics debuted in November and has seen a very good response, according to Google’s Surojit Chatterjee. The program works by assigning either a toll-free or local tracking number to an AdWords campaign, with the simple check of a box. 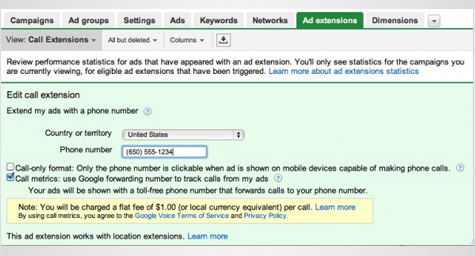 The addition of the phone number doesn’t affect the AdWords character count, which is one of the benefits of using Call Metrics rather than third-party call tracking. According to Mr. Chatterjee, ads with phone numbers in them often see higher CTRs on the PC. Despite that benefit, Call Metrics is not about driving higher CTRs, but about providing advertisers with visibility and tracking on offline leads generated by AdWords. In addition to Call Metrics, advertisers can also expect a bid-for-call marketplace on the PC which would allow advertisers to bid one price for a click and one price for a call. While this marketplace is still in the future, it would provide a potentially powerful new element for AdWords advertisers. MDG Advertising, a full-service Florida advertising agency with offices in Boca Raton and New York, NY, specializes in developing targeted interactive marketing solutions, exceptional creative executions and solid branding and media buying strategies.